The paper - a revision of ILSU Working Paper No. 2008-01/IT - aims to schematically illustrate and clarify the logical categories according to which it is hypothesized that the extralegal formant - law practitioners - of a specific civil law jurisdiction - Italy - logically understand the unity and functioning of their legal system. 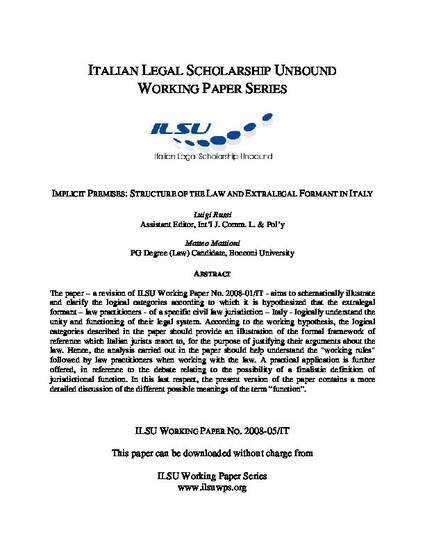 According to the working hypothesis, the logical categories described in the paper should provide an illustration of the formal framework of reference which Italian jurists resort to, for the purpose of justifying their arguments about the law. Hence, the analysis carried out in the paper should help understand the "working rules" followed by law practitioners when working with the law. A practical application is further offered, in reference to the debate relating to the possibility of a finalistic definition of jurisdictional function. In this last respect, the present version of the paper contains a more detailed discussion of the different possible meanings of the term “function”.